As you already saw, I used Orla Kiely dishtowels for these bags. They’re made of a nice heavy cotton and seem to work well for this project. Plus, they should still be available at your local Target store. 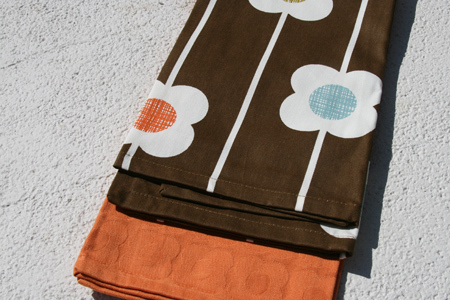 The measurements are based on the measurements of these towels (20″ x 30″), but if you didn’t want to use these, other dishtowels would work, or any fabric you have on hand (I imagine it would be quite nice in a home dec weight cotton). For this project you’ll need four dishtowels. These particular dishtowels are sold in packs of two, one printed and one solid. The two printed towels will make up the outside of the bag and the two solid towels will become the inside. I tried to maximize the size of my bag, so I used a seam ripper to open up the hem on one printed and one solid towel. The front and back panels of the outside and inside are cut from one towel each. After opening the hem, cut the towel in half across the width of the towel. Due to the way the towel is hemmed, you’ll need to cut off the top edges where it’s cut on a diagonal. You will have four panels, each measuring 22″ across by 14″ high. The remaining pieces will be cut from the two remaining towels. My diagram below shows how I cut out these pieces out of each towel. You’ll cut two straps, each 2″ in width, the length of the towel. The bottom of the bag is 15″ by 6.5″, and a pocket, which is 14″ by 10.5″. The remaining section can be used to cover the removable bottom. Cut the same pieces from the second towel. Match one printed strap and one solid strap, right sides together and sew along both long edges. Turn right side out and top stitch along each of the long edges. Hem the perimeter of the pocket piece and pin to the right side of one of your liner pieces. I like to center the pocket across the width, and attach it about 3/4″ from the bottom of the right side of the liner piece. 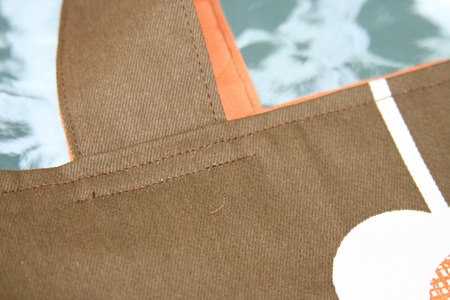 Attach the pocket to the liner piece, sewing along three sides, leaving the top open. 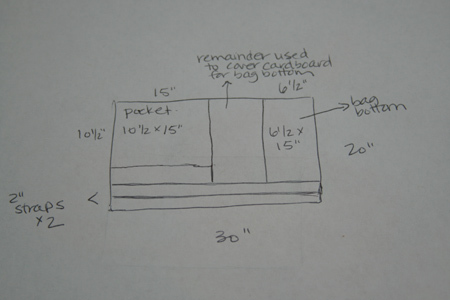 At this point, you can decide if you want to sew in any dividers. I did an offset divided pocket on the first, and stitched a line right down the center on this one, creating two equal pockets. Put the two lining pieces right sides together and stitch along both short edges. Stitch along this edge, starting and stopping 1/4″ from each edge. Repeat to attach the second side to the second lining piece. You now have the shape of a bag, with an opening at either end of the bottom piece. 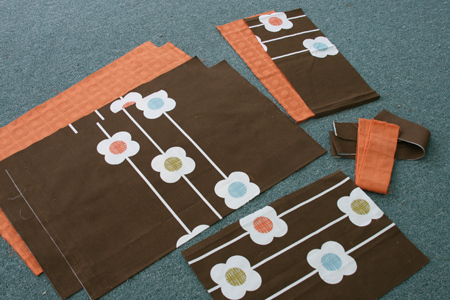 Repeat the same steps (Sew the lining) to create the outside of the bag. Now you’re ready to put the bags together! There are two methods – probably a right and a wrong… who knows! 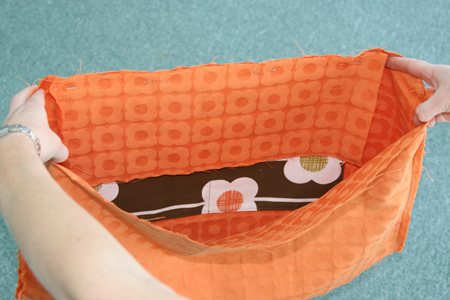 Place the outside bag inside the liner, right sides together. Slip the handles in between these two layers, right sides together (the straps should be positioned straight, not on an angle as pictured below!). Pin and sew along the top edge, leaving an opening large enough to pull the bag pieces through. Fold in the raw edges of the opening and top stitch around the top edge. 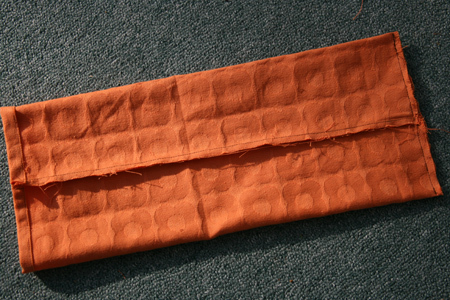 Place the liner inside the outer bag, wrong sides together, lining up the side seams. Fold the top edges inwards and iron flat. Slip the handles in between the layers, positioning them as you’d like. I placed mine about 4″ from each seam. Topstitch along the top edge. 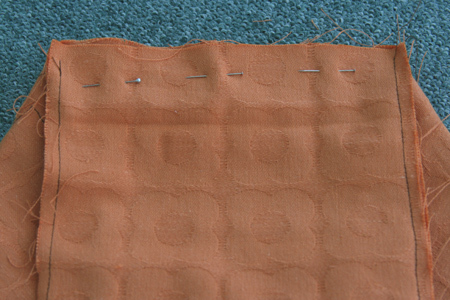 To make sure the handles are secured, I also add an additional stitch line, about 1/4″ below the topstitched line. I used cardboard pieces to create a solid bottom for this bag. My cardboard was a bit thin, so I used two layers. 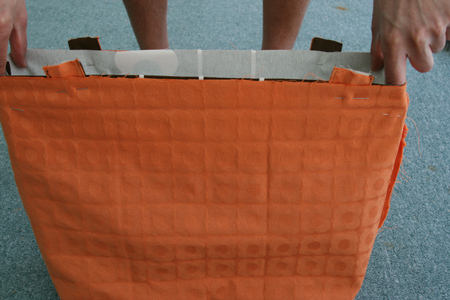 Use your remaining fabric to create a sleeve for the cardboard. 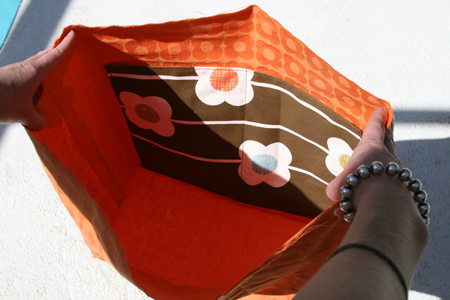 On my first bag, I had enough of the printed towel, but on this one I did not, so I used the remaining liner fabric. Cut the cardboard 6″ x 14 1/2″. Take your remaining fabric piece and cut a piece large enough to fit around the cardboard, leaving enough extra for the seam allowance. 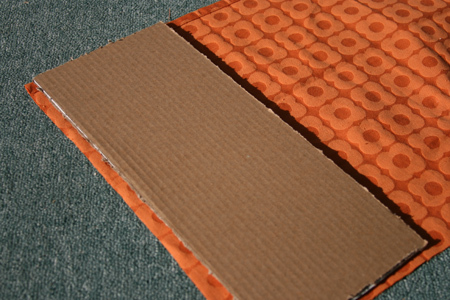 My two pieces of cardboard put together measured 1/4″ thick, so I cut the fabric 13″ wide. It measured 15″ in length already, and the piece I had leftover already was hemmed on one end, which I left as the opening. With right sides together, sew along the long edge, then flatten the tube so that the seam is in the center of one side. Sew the un-hemmed edge shut. Flip right side out and slide the cardboard inside. If you leave the hemmed edge open, you can replace the cardboard if needed, or remove it for washing. 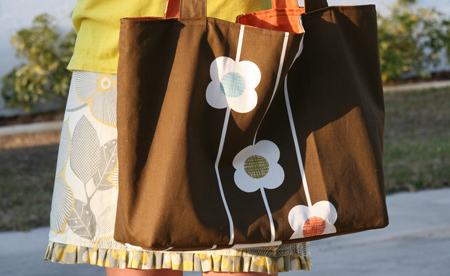 Trim all threads and admire your new large tote bag! As always, feel free to email me with any questions! 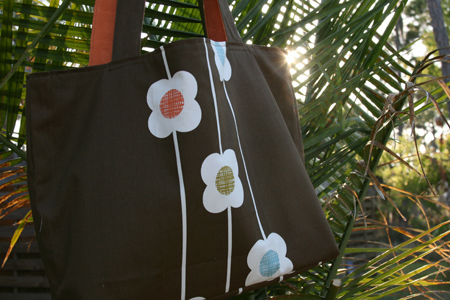 This entry was posted in Tutorials and tagged bag, beach bag, dishtowels, handmade, Orla Kiely, Target, tote, tutorial. Bookmark the permalink. Great tutorial! I love how much you’re still blogging while prepping for the wedding! Fun mixed with more fun! Wonderful! Thank you! I knew I needed to go to Target yesterday – now I know that I need to go today! I’m going to Florida in April – and I “need” one of these to bring. Thanks for posting this! I was hoping there would be a tut after the original post. Best wishes for the wedding!! Thanks for this tutorial! I only bought one set of pear towels-hope I can find a second set! Cheers to your wedding. This is great! Thank you so much! Have a great wedding !! I have so many totes, but you have me “needing” one more! Have a great wedding. Love the tut and the tote, how about a tut for the cute skirt you have on in the pic! 🙂 Happy Wedding! I have GOT to get up to Target for some of these designs!! Oh my! Wonderful bag and great tutorial. Thanks for sharing it! Oh thank you, thank you, thank you! I didn’t want to ask, since I had already asked about the napkins. :~) This is wonderful. I love this idea. I had no idea the bag was made out f dish towels. I am now on the hunt for some cute dish towels. Thanks for the tutorial. Ok…so far I’ve bought enough of these towels to make 6 bags!! Somebody stop me!! Too cute…so far I’ve only cut the pieces for the first bag, but I can’t wait to have more time to make them!! What a wonderful tutorial.Got to make few of these! I made one! I copied your brown one because both our Target stores are out of the pear print (waah!). It turned out great! Thanks for the tutorial. Can’t wait to make a few more. What a great tutorial. Can’t wait to give it a try. Thanks! 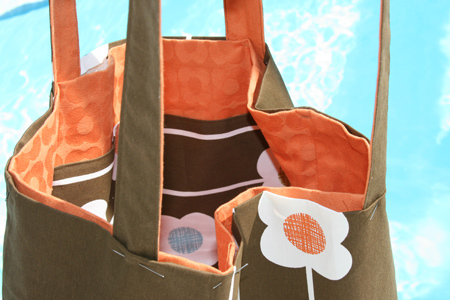 I wasn’t going to succumb to the Orla Kiely, either, but I saw the towels hanging at my Target, remembered this tutorial, and am now planning on making my own beach bag this week. Thanks so much for sharing! Brilliant!! I have been searching around for a large tote bag to make and this looks like the winner! Thanks! 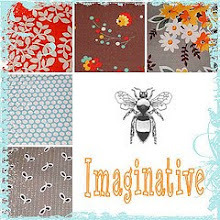 I’m linking to this project at Dollar Store Crafts! Nice work! 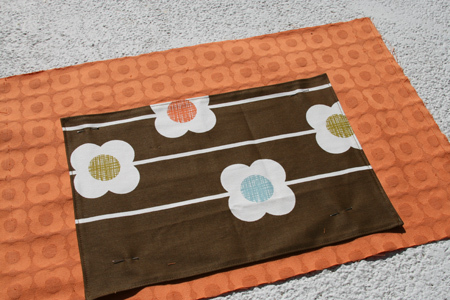 Love the use of Orla Kiely textiles!! 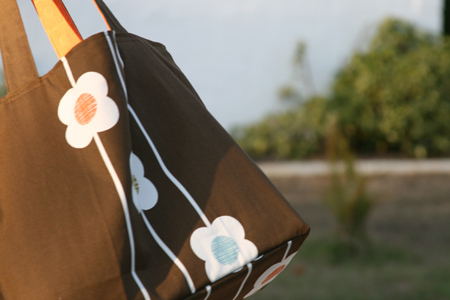 Pingback: Pick A Free Bag Pattern! LOVE this tutorial! I put the straps on wrong and had to redo the whole thing. Wish I would have paid more attention to your super easy to follow directions. 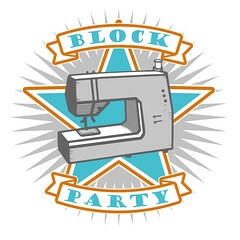 =) I blogged about the finished project at http://mrandmrswadsworth.blogspot.com/2010/02/projects.html Thanks again!